There’s a story behind this passenger rail car, which was parked under the Albany overpass a few days ago. To get it, I went to Bob Melbo, who has had the answer to every railroad-connected question I have ever asked him. The lettering says the car belongs to the California Northern, a subsidiary of RailAmerica. And Melbo, formerly with the Southern Pacific, then the Portland & Western and now with ODOT-Rail, came through as usual. 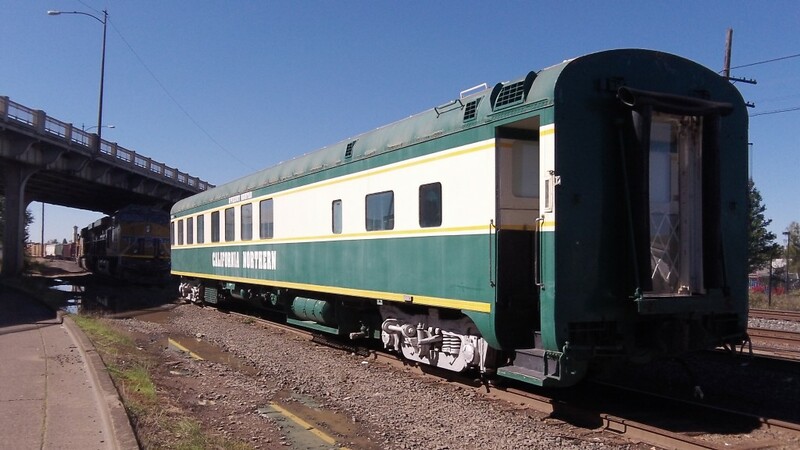 He says this observation car, named the Appekunny Mountain, was built in 1950 for the Empire Builder, which ran between Chicago and Portland and Seattle. It had 32 seats in the lounge and two roomettes at the forward end. In 1984, painted in the colors of the SP’s “Daylight,” it brought up the rear of a special train to the Louisiana World’s Fair in New Orleans. The Genesee & Wyoming, parent company of the Portland & Western, obtained the car when it bought RailAmerica last December, and the P&W just brought it to Albany for some work. From Ted Salmons: Sounds like your friend has a “multi-track” mind. Nice info on the observation car. Verle Steele, on Facebook: Thanks for the info, Hasso. Always interesting to see mementos of our railway passenger history, and wonder why it is not in-grained into our transportation system today.